Did ths on first day in Budapest, help get our bearings. To start with Greta was our guid, what a wonderful people and her knowledge was fantastic. We got a great tour and lots of information. She asked what we wanted to see, there was only a few things on our list and left the rest up to her. What had some museums we wanted to see later, after telling her of these, she suggested some others instead, took her advise and no regrets. She also explained the public transit system, thank-you Greta. The Goulash soup was a great. She also suggested a ruin bar as a must see, because of her suggestion we tried it, great fun. Once again thanks Greta for helping make our trip unforgettable. Fun and lively tour of both Buda and Pest. This tour is not for the timid, but the tuk tuk was very enjoyable. It was pretty chilly, though! The blankets did help with that. Peter was a very good guide and the goulash was very tasty. The only way to see the city. Can't say enough good things about this adventure. I recommend this is the first thing you do in Budapest. You get a great feel of the city and what to visit later. this is not for people with bad backs. However if you have trouble walking this is the best way to see the city. GREAT and FUN adventure in Budapest ! 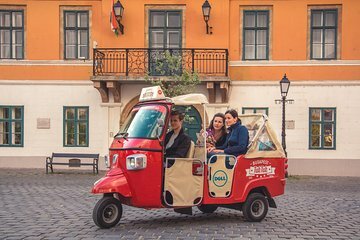 We loved it and would highly recommend this to anyone visiting Budapest.